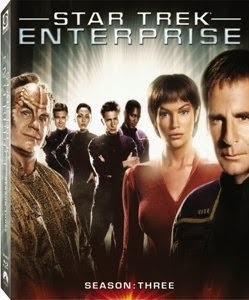 I can’t be the only Star Trek fan to have discovered Enterprise on Blu-ray. In my reviews of seasons one and two I have discussed my regret in ignoring the show when it aired on television. 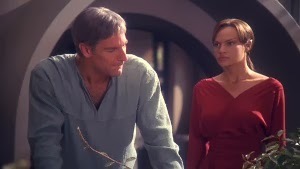 Having just completed the third season, I feel even more that Enterprise had a lot to offer if it had been given more of a chance. The third season saw a fully-developed, continuous storyline that marked the beginning of a more mature Enterprise. Unlike the first two seasons, the writers were allowed to build a story arc that would last throughout the season. This allowed for much deeper character development and storytelling in general. Jumping off from the second season finale, in which seven million people on Earth are killed in an alien attack, the crew of the Enterprise takes off after the mysterious Xindi. The Xindi want to destroy the Earth and human life in a pre-emptive strike because they believe humans will ultimately destroy them. This mission leads the Enterprise into an uncharted territory known as the Expanse. One of the most intriguing aspects of this season is the variety of moral dilemmas that often confronts the crew. Captain Archer (Scott Bakula) is faced with finding and destroying the enemy by any means necessary. Trip Tucker (Connor Trinneer) must deal with his anger over the death of his sister in the Xindi attack, which at times leads him to act without objectivity. The crew also finds themselves at odds with the addition of the MACOs, a combat-ready team who are more about fighting than exploring. Malcolm Reed (Dominic Keating), in particular, has trouble working with the MACO’s leader Major Hayes (Steven Culp). 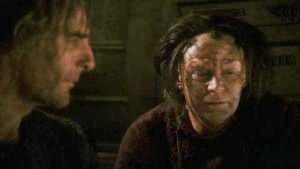 If I had only one word to sum up season three, that word would be “conflict.” Everybody is facing some kind of conflict, whether it’s with the Xindi or something more personal. One usual bit of personal conflict that I didn’t think quite worked was T’Pol’s (Jolene Blalock) inexplicable drug addiction. I won’t go into detail about the circumstances, but to me it seemed like they were trying to find ways to give the character emotions. It’s almost like they regretted having a Vulcan character. I don’t think that’s the case, but they really went out their way to make T’Pol react with anger or sadness – even lustfulness. I didn’t think it was necessary. There were plenty of well-crafted episodes in season three. Of course there were a few clunkers too – an episode taking place in an Old West (“North Star”), or a complete red herring episode involving Dr. Phlox (John Billingsley) having the ship to himself for a couple days (“Doctor’s Orders”). Thankfully the good ones more than make up for the not-so-good. 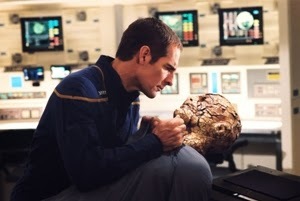 We get Vulcan zombies (“Impulse”), time travel to then-present-day Detroit (“Carpenter Street”), a clone of Trip (“Similitude”), and chance to meet the descendants of the Enterprise crew (“E²”), just a to name a few of my favorite things about season three. As with the previous seasons, the special features here offer some great insight into the show’s troubled production. The cast and crew are open about their frustrations with the network’s demands and the failure of the show to really catch on with Trek fans. John Billingsley is particularly open about his distaste for some of the storylines. He was not a fan of the “by any means necessary” attitude the captain was forced to take. Jolene Blalock also expressed frustration over not liking the direction they were taking her character. Not that it’s all complaints. The actors also shared what the show has meant to them. I personally find it interesting to see a well-rounded interview that offers more than everyone simply throwing around empty platitudes. The Blu-ray set contains a 90-minute (broken into three parts) documentary called “In the Time of War” which features interviews with the entire cast as well as creator Brannon Braga and producer Manny Coto. There are also outtakes, bloopers, deleted scenes, and commentary tracks (on select episodes). Though the show tends to be the most often maligned Star Trek series, this Blu-ray set gets the full treatment as far as extras go. As I have said in my previous reviews, I encourage any Trek fan (who hasn’t already) to give Enterprise a fair chance.